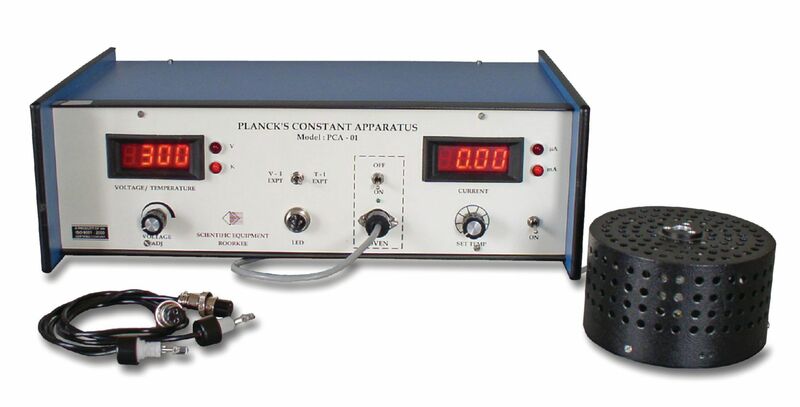 With this apparatus, students compute the value for Planck’s Constant using a LED. The accuracy is improved by conducting precise measurements of the band gap voltage Vo. Students plot the I-V characteristics of the LED at room temperature for determination of material constant and plot the current versus temperature curve of the LED at a fixed voltage closely below Vo. These plots enable students to get an accurate estimate of band gap Vo for the LED. The wavelength of the emitting LED light can be taken from LED datasheet or measured with spectrometer. Using these parameters, students can compute the Planck’s constant within 5% of accepted value, and the physical interpretation of their results is clear. The self-contained unit includes a current meter with range of 0—2mA and resolution of 1μA, a temperature-controlled oven with RTD and stability of ±0.2°C, a voltmeter/voltage source, and two LEDs.